The packaging tells consumers that they’re made from “a unique blend of corn and wheat” and that they’re “soft, flexible, & whole grain.” They’re not lying. They are super flexible. They don’t break when you roll an enchilada. And they don’t dry out over time (make sure to store them in the cupboard, though, not the fridge). They’re relatively healthy. But most importantly, they’re delicious. 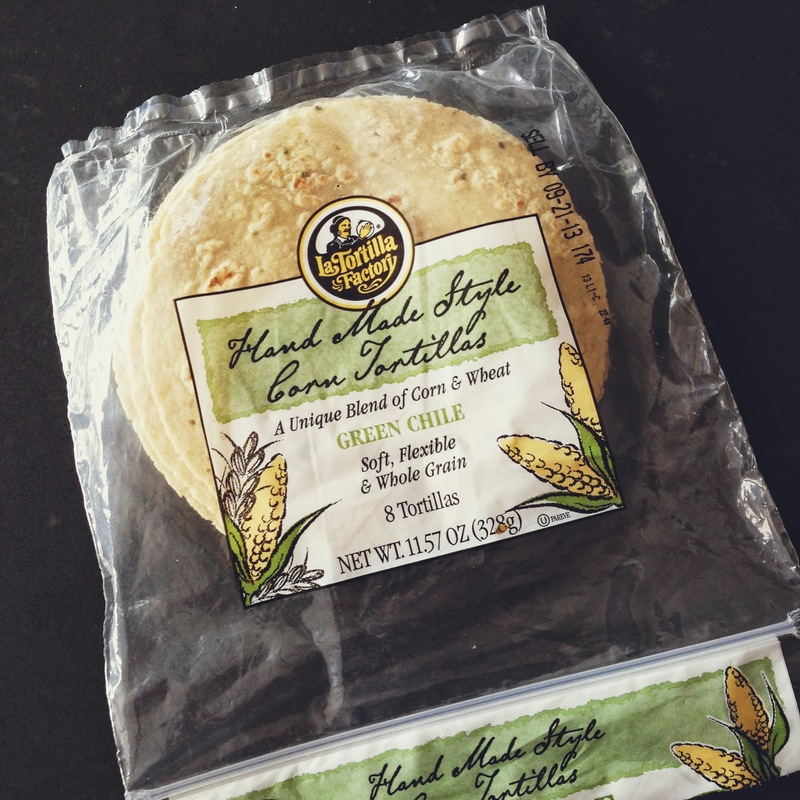 They come in two sizes, and four varieties: white corn, yellow corn, green chile, and chipotle. All good. The other night I took these tortillas’ goodness to an even higher level. I charred them over an open burner before serving them as soft tacos. I’d never done that before. It was exciting. It felt very adventurous on a Monday night; smoking tortillas over an open flame. If you haven’t done it before, you should try it. Combined with some fancy Upton’s chorizo seitan I’d picked up at Whole Foods, these tacos were memorable. The main component (aside from the tortillas) was eggs, but I refuse to call them breakfast tacos. First of all, we ate them for dinner. Second of all, who says eggs have to be a breakfast item? That’s just narrow-minded. 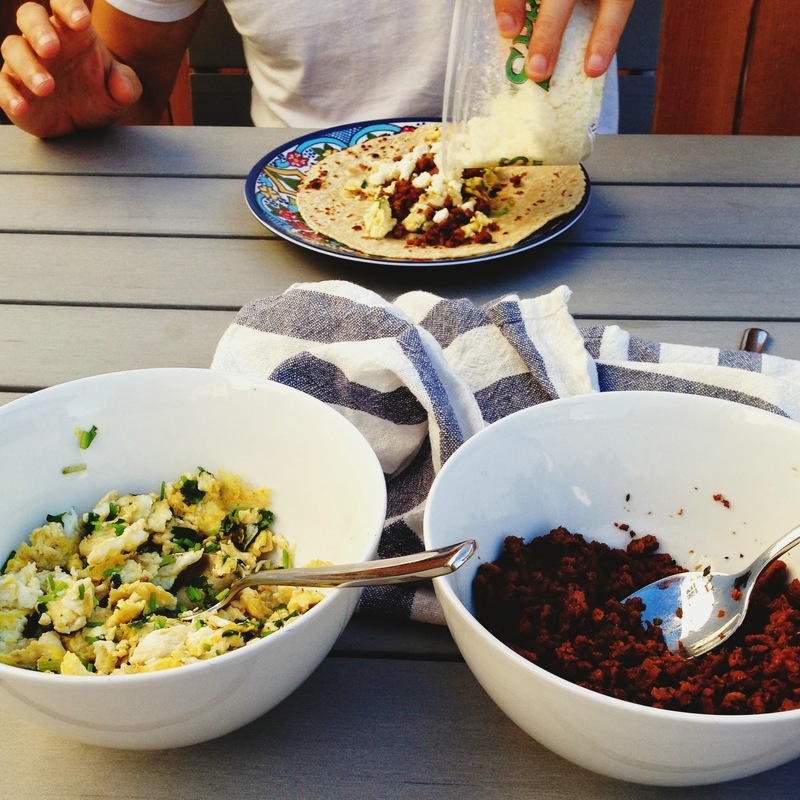 So yes, these are egg tacos, but eat them anytime of day. They’d be great for breakfast, lunch, dinner, or perhaps best as a midnight snack. Either way, make sure to use great tortillas and char them up! You can certainly use regular chorizo instead of chorizo seitan. I’m sure that would be equally (if not more?) delicious. But less healthy, let’s be honest. Also, I did steps 4 + 5 simultaneously, but it was a bit touch and go at moments with the tortilla charring. If you’d prefer to play it safe, you might want focus your attention on each individual step. 1. Preheat oven to 175 degrees, for keeping ingredients warm until serving. 2. In a non-stick pan, sauté the mushrooms and onion in a dash of olive oil until softened. Place in heat proof bowl and keep warm in the oven. 3. In the same pan, sauté the chorizo until lightly browned. Place in bowl and keep in oven. 4. 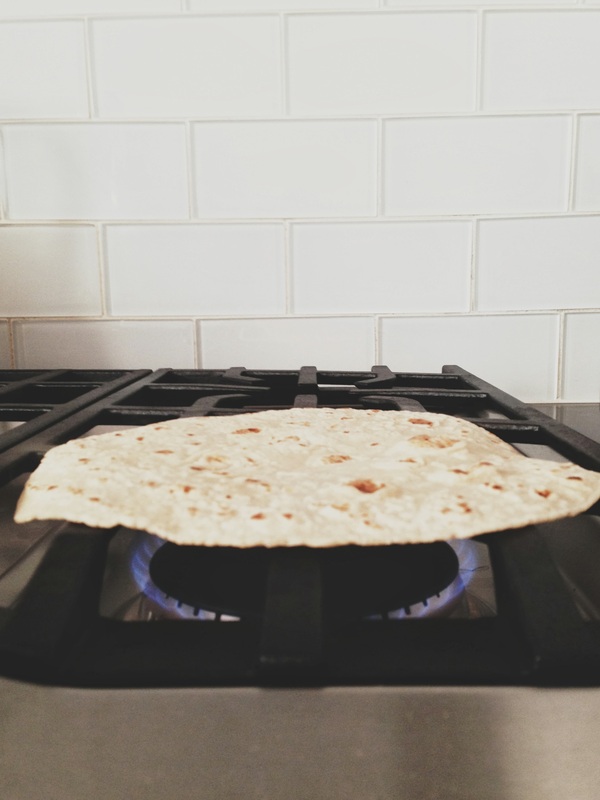 Prep tortillas: place each tortilla on a burner and char for 1-2 minutes per side. (I kept my burner at medium-low, and it worked pretty well. Meaning, I got charring but did not light anything on fire.) Wrap tortillas in a clean dishtowel to keep warm and soft. 5. Scramble eggs. Add some chopped cilantro when the eggs are nearly done. Move to bowl and keep warm in oven. 6. 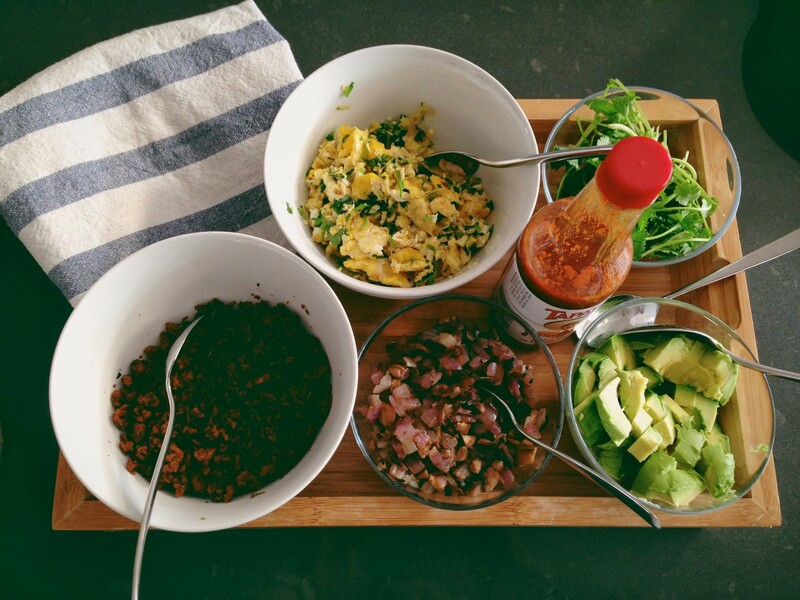 Take everything to the table and make your tacos! 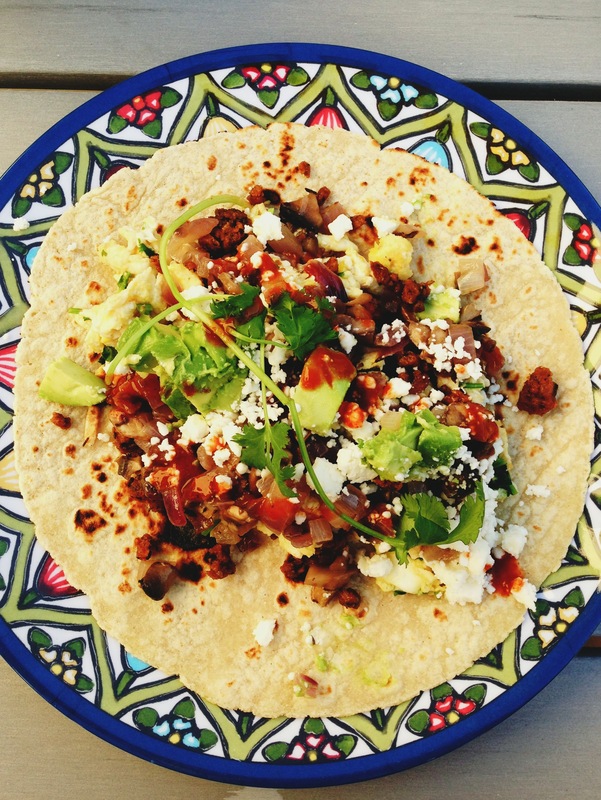 To the amazing tortillas, add egg, veggies, chorizo seitan, avocado cilantro, feta, and hot sauce. oh MY gosh Zach and i found these at Sprouts recently. we are IN LOVE with them. I really want to make a breakfast burrito in them, i think they’d be amazing with eggs and peppers! i’m so jealous! i may need to try your recipe!